Located in Zone A, Sicap, Maison 46 – standing for 10 years, is destined for demolition to make way for a new development. 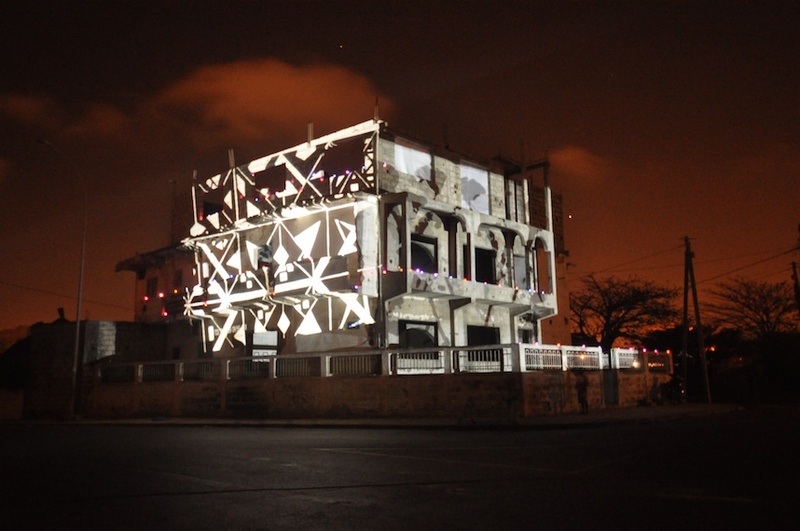 In collaboration with students from the Ecole de Beaux Arts in Dakar, a series of projection and performance scenes were developed as a reflection on the pathetic state of this building and the expectations of a new architecture to come. Hobbs/Neustetter’s extended practice in South Africa as consultants to public art and urban design regeneration initiatives has heightened their awareness, on other related projects in Africa, to the unique and particular conditions surrounding contingent innovation in local architecture and spatial practices. As a performance, Entracte responds to the unusual circumstances where the predictable restrictions placed by western building standards; public health and safety and user regulations, for example, is bi-passed by virtue of the experimental and opportunistic characteristics of perhaps less regulated urban situations. In this sense Entracte or intermission, takes advantage of the gap in the narrative of urban planning and reflects on the potential of the creative city in Africa. Hobbs/Neustetter’s performance of live action, photographic stills, video and lazer projections included Aurora Sound Recordings by James Webb (SA) and selected tracks from Joao Orecchia’s (SA) 2009 release Hands and Feet.